This year we have seen that Indian economy is badly affected due to rupee depreciation. 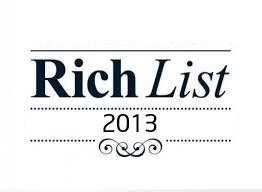 Despite of downturn we have 141 Indian who made it India rich list 2013. As per Hurun India Rich List 101 individual has maintain / increased their wealth and for 40 fall is observed. Surprisingly this year we have new entry of Bollywood super star Shahrukh Khan in to Rich list with worth $ 400 million. Shahrukh Khan has setup company Red Chillies Entertainment having ranking of 114 on rich list. Shahrukh is only person from Bollywood who has made in to rich list. 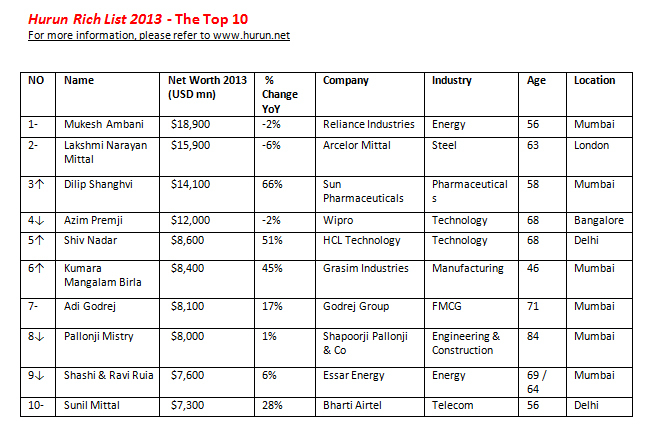 In India rich list 2013 we have Mukesh Ambani of Reliance on top with worth more than $ 18900 million. At second number we have L N mittal the steel tycoon of Arcelor Mittal (world’s largest steel making company). Dilip Shanghvi founder of Sun Pharma is on third position with net worth of $ 14100 million. On fourth and fifth position we have Azim Premji & Shiv Nadar from IT space with net worth of $ 12000 million and $ 8600 million. This time Anil Ambani younger brother of Mukesh Ambani could not make it to top 10 he is on 11th position with net worth of $7100 million. Sixty-four per cent of the individuals in the list are self-made millionaires. The Indian stock exchanges were the preferred place to list followed by London and Singapore. The average age of the Top 100 is 63 years. There are four millionaires below the age of 40. Dubai emerged as the most preferred overseas location for Indian businessmen.